With the increasing popularity of "vaping" across the world, a new study from Respiratory Research shows that regardless of flavor, vaping does less damage to the lungs than conventional smoking. E-cigarettes are battery-powered devices that deliver nicotine by heating an “e-liquid”. E-cigarette use, commonly known as vaping, has gained significant popularity, particularly among the younger generation as more information continues to emerge regarding the adverse health effects of conventional cigarettes. Smokers are now turning to e-cigarettes as the safer alternative. Yet, despite increasing research, the potential health effects of e-cigarette vapor are largely unknown. The potential health effects of e-cigarette vapor are largely unknown. Due to their small size, the particles in e-cigarette vapor can reach deep into the lungs and a number of studies have focused on how e-cigarettes affect the cells of the pulmonary airways or the deep lungs. The majority of such studies have reported that e-cigarette vapor is less toxic compared to cigarette smoke; however, toxicity from e-cigarette vapor has been reported, depending on the dose and the flavoring of the e-liquid. While the studies on the effects of e-cigarette vapor on cell viability are undoubtedly important, an important aspect of e-cigarette toxicity, its potential effects on lung surfactant, has received far less attention. Pulmonary surfactant is a mixture of lipids and proteins that lines the alveolar region of the lungs. The main function of this surfactant layer is to reduce the surface tension of the alveolar fluid, thereby decreasing the work of breathing and preventing alveolar collapse. Surfactant is critical for lung function. Preterm infants who are born without surfactant suffer from infant respiratory distress and need to be treated with exogenous surfactant. Pulmonary surfactant comes into contact with all inhaled particles including those from e-cigarette vapor. Our research was aimed at understanding whether e-cigarette vapor affects the ability of surfactant to reduce surface tension. This study used calf lung surfactant extract (Infasurf®, ONY Inc.), clinically used for the treatment of preterm infants, as the surfactant model. Infasurf® was placed in a Langmuir-Wilhelmy setup, which allows for compressing the surfactant, mimicking lung mechanics, while measuring its surface tension. This setup was used to measure changes in surfactant after exposure to air, e-cigarette with three different e-liquid flavors (tobacco, berry, and mint), and conventional cigarettes. The use of different e-cigarette flavors was important as changing the e-liquid flavoring has been shown to change the chemicals in e-cigarette vapor. Results of the study found that e-cigarette vapor, regardless of its flavoring, does not affect the ability of surfactant to reduce surface tension. In contrast, conventional cigarettes significantly inhibited the ability of surfactant to reduce surface tension upon compression. We found that adverse effects of cigarette smoke on surfactant were induced by tar, which is the product of burning, and other major components of cigarette smoke (nicotine, acetaldehyde, and isoprene) did not cause surfactant disruption. This observation explains why e-cigarette vapor does not inhibit surfactant function, since e-cigarette involves vaporization, but not burning. Compression of surfactant results in the formation of a microstructure, which is the result of changes in surfactant molecular organization. A hill and valley structure starts to appear in surfactant upon compression and get larger as surfactant is further compressed. It was found that e-cigarette vapor affects this microstructure, resulting in wider, and more frequent hills (Figure 1). While the importance of this change in surfactant structure is still unknown to us, this observation suggests that slight changes in surfactant do occur after exposure to e-cigarette and might result in changes in surface tension if a higher dose of e-cigarette vapor is used. 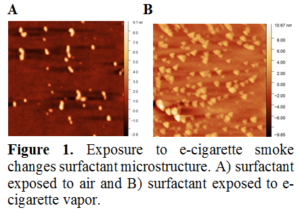 E-cigarette vapor does not change the ability of surfactant to reduce the surface tension, but does affect its microstructure. While e-cigarettes are significantly less disruptive to surfactant compared to conventional cigarettes, the observed lack of changes in surfactant function after exposure to e-cigarette vapor should not be perceived as a lack of pulmonary toxicity. It is still not known if e-cigarette might affect surfactant production by cells or its secretion. Comprehensive studies on the effects of e-cigarette vapor on surfactant production, secretion, and function are needed to provide a better understanding of the pulmonary toxicity of e-cigarettes. Amir M. Farnoud is an Assistant Professor in Chemical and Biomolecular Engineering at Ohio University. Amir’s research primarily focuses on the interactions of nanomaterials with lipid interfaces, such as the pulmonary surfactant and the cell membrane. His group also focuses on using nanoparticles as targeted drug delivery vehicles. You can follow Amir’s lab on twitter.